Have you ever wondered what people chat about in Asian Rooms, or Middle Easteren rooms. Or in Rooms where your Language is not supported. Well now you have a chance to sit tight and watch everything be Translated Automatically. 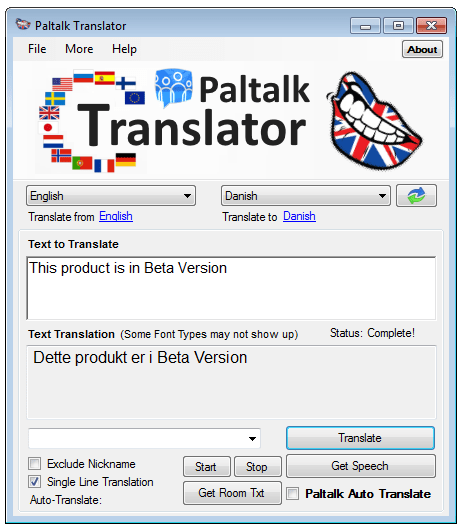 Paltalk Translator comes with an Auto-Translation option. Start your Program and it will Automatically grab the incomming text in the chat room and translate it in mili seconds. You can Translate any Text that is being typed within the Room and supports the same Languages as in Google Translator. Notice that today Google Translate costs Money if used for 3rd Party Applications. But you can use this for Free and Translate any Text or get a complete Speech Translation of your Text! You need to Install Microsoft NET.Framework 4.0 or 4.0 Client Profile to run this Software. i hope they make this app better because its one off the most useful apps ever!